Online Application Form for AP NFTW Awards 2018. 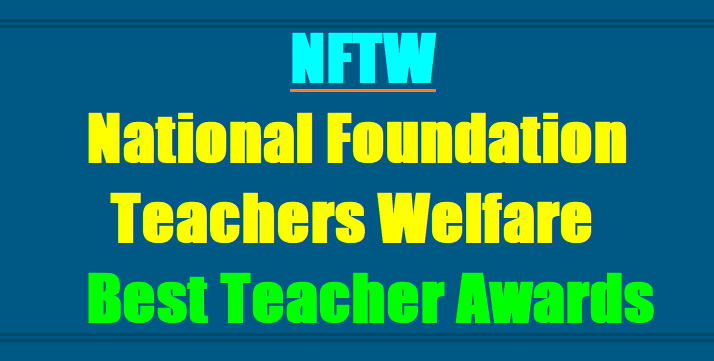 The Secretary Treasurer, National Foundation for Teacher's Welfare and Commissioner of School Education Department has given the AP National Foundation for Teachers Welfare Best Teacher Awards 2018 Notification and invites the applications from the teachers. Here, TeachersBadi.In Team is providing the certain guidelines for selection of National Foundation Best Teachers Welfare Award 2018. National Foundation for Teachers' Welfare, AP,Hyderabad will be Celebrated of Teachers' Day function on 5th September 2018 at Hyderabad and Honouring working and retired teachers at State Level Function. National Foundation Teachers Welfare Best Teacher Awards 2018: CSE Department has informed to all the District Educational Officers in the State as per above mentioned subject every year 5th September is being celebrated as Teachers' Day (GURUPUJOTHSAVAM) throughout the Country. This Day has a special significance for us, as it happens to be the birthday of our revered former President of India late Dr.Sarvepalli Radhakrishnan who himself was a Teacher of International Status. to the SECRETARY-TREASURER,. NATIONAL FOUNDATION FOR TEACHERS' WELFARE & COMMISSIONER OF SCHOOL EDUCATION, ANDHRA PRADESH, HYDERABAD- 500 004 ON OR BEFORE announced schedule for finalizing the candidates for the Awards of National Foundation for Teachers' Welfare before the state Level Committee. The District Educational Officers to bestow their personal attention in the matter and see that the proposals in respect of Working/Retired Teachers of their District are sent to this office before as per given schedule positively.